Folded by hand nine times to produce 1024 layers, this blade comes highly sharpened and supported by a traditional full tang construction. 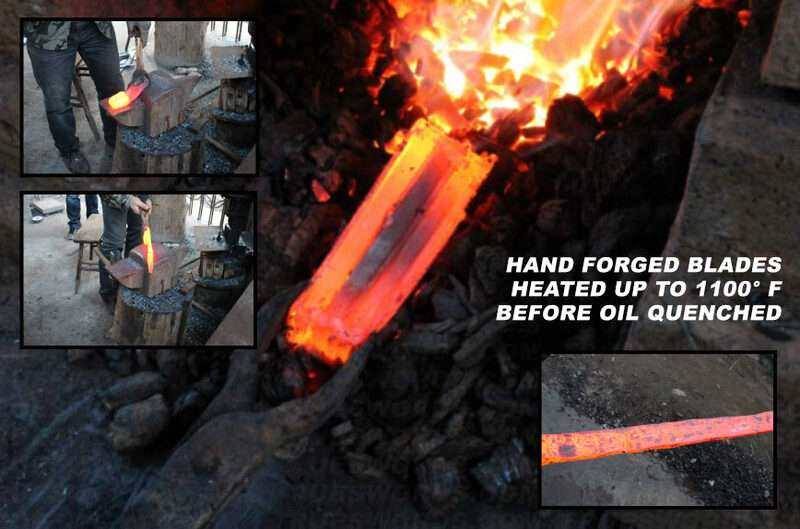 The blood red wrapping provides a secure grip while offering striking contrast to the natural finished Damascus blade. Dark design hues and Monkey tsuba artwork give this piece a personality all its own. I have recently purchased this weapon and it's a nice extension of one's arm...the pattern on the blade is mild but nice to look at. Performance is quite nice as it has withstood all but 1 material I have put it against and even then it was minimal damage to the blade that can easily be tuned with a stone. I won't say what that material is as finding out exactly what your weapon is capable of is part of the thrill. It's a nice example of what a good blade should be compared to a wall hanger. I would recommend this blade to those starting a collection and to veteran collectors like myself who understand the term I must express it's a "light cutter"...all in all a very nice blade to have in your arsenal. 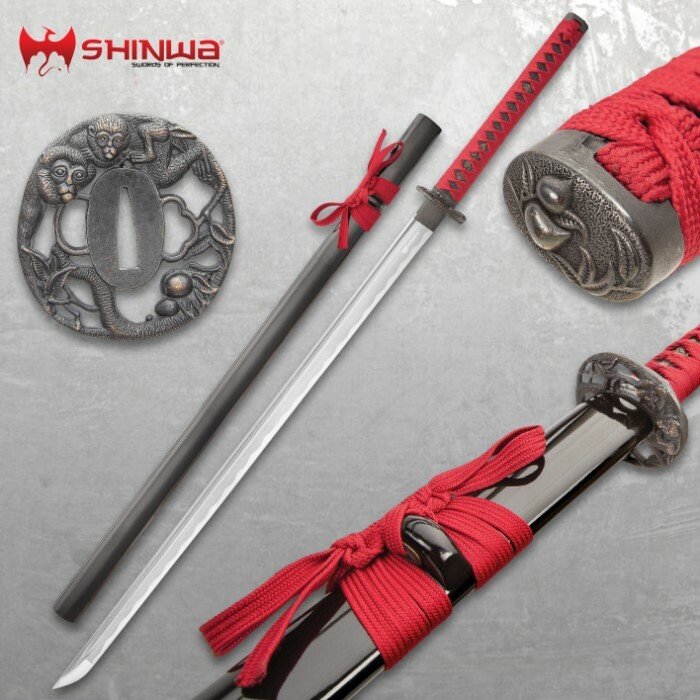 Another Shinwa that is well worth buying. A very , very nice addition to my collection. The sword has been folded only 10 times. Each time you fold it, you double the amount of layers. Wow first review!! I am very happy with this sword!!! I just got it and was so happy when I opened the box! It's beautiful yet deadly. Very nice! Another excellent choice from True Swords! I am really happy. Very satisfied. Great item. Very good quality. Would highly recommend! It is a sturdy blade, but not as Sharpe as I had hoped. I fixed that rather quickly. I recently purchased this sword for my collection.It has a great feel to it. 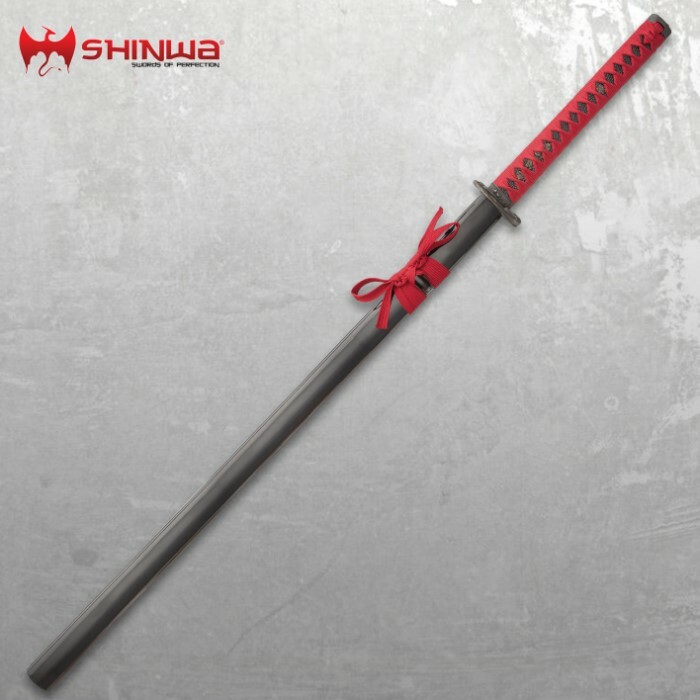 Shinwa makes a great product and is well crafted.This sword was worth every nickle, you will not be dissapointed. Thanks BUDK !! !